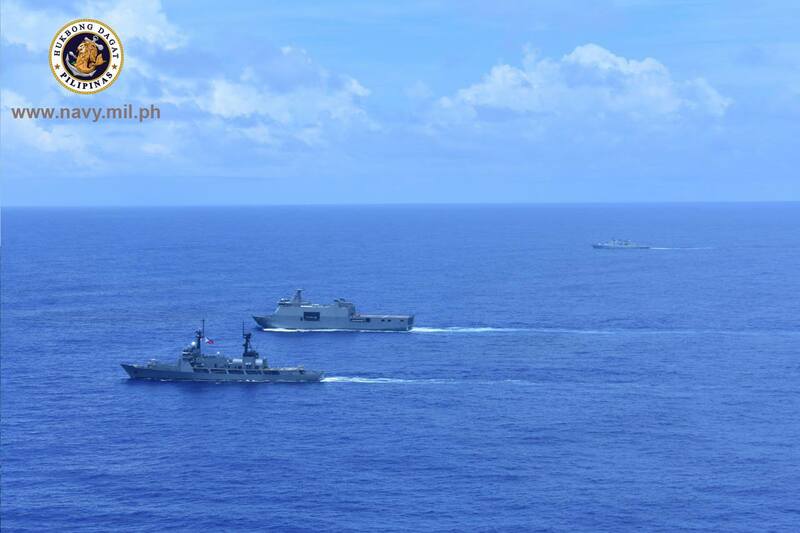 Staying clear of Tropical Storm “Domeng,” the Philippine Navy contingent, Barko ng Republika ng Pilipinas (BRP) DAVAO DEL SUR (LD 602) and BRP ANDRES BONIFACIO (FF 17), together with the Royal Malaysian Navy (RMN) ship KD LEKIU sails for the Rim of the Pacific (RIMPAC) Exercise 2018, the world’s largest international naval exercise. The embarked Augusta Westland (AW-109) naval helicopter captured the Philippine Navy and RMN vessels as it performed naval maneuvers and communications exercises while underway near Fais Island, Ulithi Atoll in the eastern Caroline Islands in the Pacific Ocean as it sails en route to RIMPAC 2018 exercise. BRP DAVAO DEL SUR (LD 602) ably managed to perform flight deck operations and photo exercise (PHOTEX) with BRP ANDRES BONIFACIO (FF17) and RMN’s KD LEKIU. KD LEKIU earlier called on the port of Cebu and sailed with the Philippine Navy contingent when it left the Philippines last 06 June 2018. The flotilla will have a brief stopover at Kwajalein Atoll and will rendezvous with navies from Indonesia, Japan and India for a group sail enroute to Honolulu, Hawaii. The ships are expected to arrive in Hawaii on 25 June 2018. The RIMPAC will be from 27 June to 02 August 2018. The Republic of Singapore Navy (RSN)'s Formidable-class frigate RSS Tenacious participated in a Multinational Group Sail with partner navies from ASEAN and beyond the region from 22 to 24 June 2018 (Singapore time). 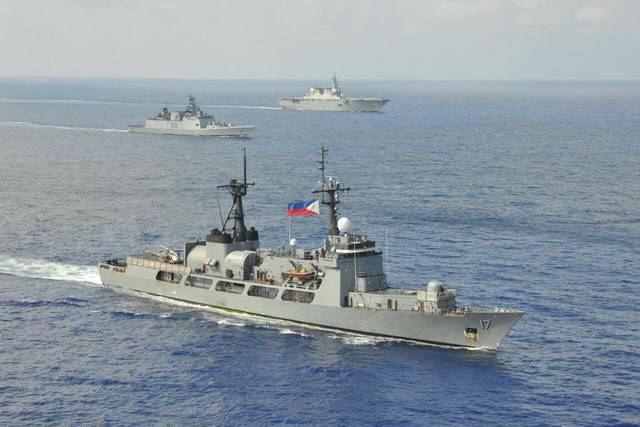 Warships from the RSN, Indian Navy (IN), Japan Maritime Self-Defense Force (JMSDF), Philippine Navy (PN) and United States Navy (USN) sailed from the waters off Guam to Hawaii to participate in the Rim of the Pacific Exercise (Ex RIMPAC). BRP Andres Bonifacio arriving at Pearl Harbor, Hawaii on June 26, 2018. Crew of the BRP Andres Bonifacio (FF-17) mans the rails and honors the USS Missouri (foreground) and the USS Arizona (memorial in background) as the ship enters Pearl Harbor for the start of RIMPAC 2018. Philippine Navy Naval Task Force RIMPAC Commander, Captain Ernesto O Baldovino PN(GSC) and Commander Jerry Y Garrido PN(GSC), Commanding Officer, BRP Andres Bonifacio (FF17) welcome Vice Admiral John D Alexander, Commander, United States 3rd Fleet during his visit at Bravo Pier, Joint Base Pearl Harbor-Hickam, Hawaii, June 27. Life onboard BRP Andres Bonifacio while at RIMPAC 2018. Life aboard BRP Andres Bonifacio during RIMPAC 2018. Philippine Navy Seebees Band performs aboard BRP Andres Bonifacio (FF-17) during Open Ship at RIMPAC 2018, July 7, 2018. Philippine Navy frigate BRP Andres Bonifacio (FF-17) departs Joint Base Pearl-Harbor to begin the at-sea phase of the Rim of the Pacific (RIMPAC) exercise, July 10. Philippine Navy frigate BRP Andrés Bonifacio (FF 17) departs Joint Base Pearl Harbor-Hickam to begin the at-sea phase of the Rim of the Pacific (RIMPAC) exercise, July 10. MANILA -- The frigate BRP Andres Bonifacio (FF-17), one of the two Filipino warships participating in this year's "Rim of the Pacific" (RIMPAC) exercise in Hawaii, got a warm reception from their US Navy counterparts during the start of the Force Integration Phase (FIP), Philippine Navy (PN) spokesperson Cmdr. Jonathan Zata said Tuesday. RIMPAC's FIP started on July 11 and will end on July 19. 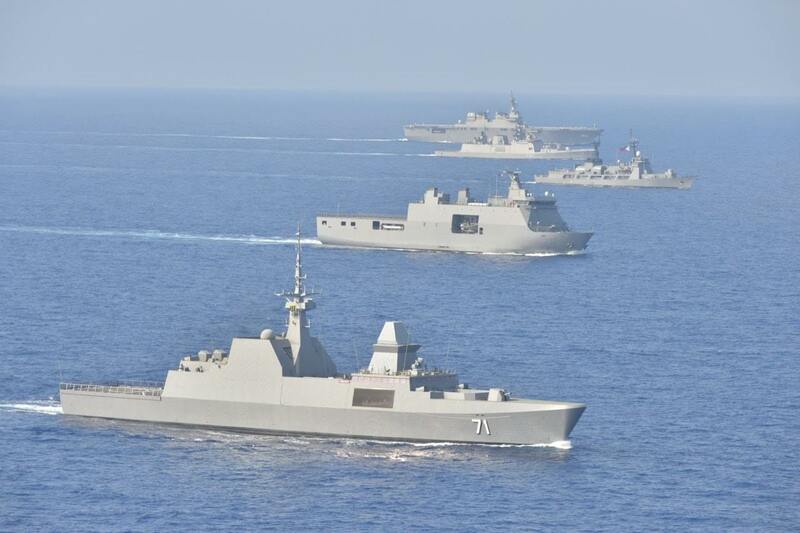 Around 50 warships and aircraft are now taking part in the exercise. The ships and their crew joined in serialized trainings which include visit, board, search and seizure, gunnery exercise, replenishment-at-sea, combined anti-submarine and anti-air warfare drills. 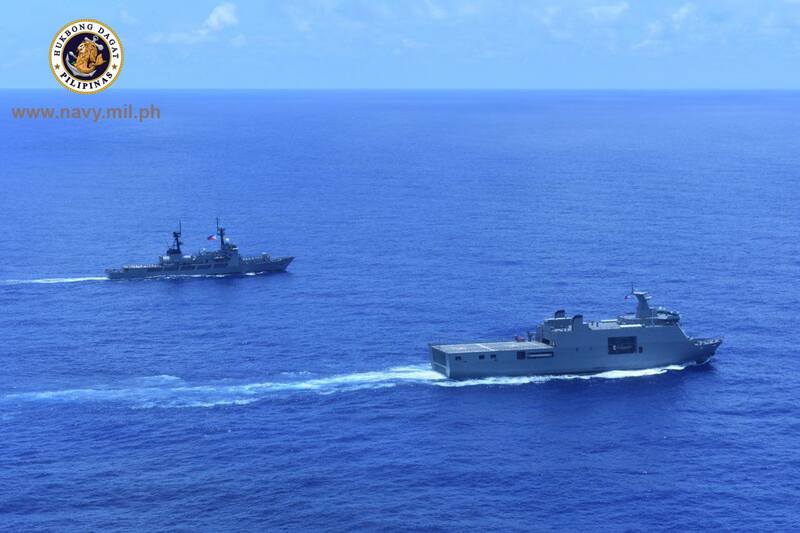 The Philippine naval contingent for RIMPAC's FIP consist of the frigate BRP Andres Bonifacio (FF-17) and strategic sealift vessel BRP Davao Del Sur (LD-602) and an AW-109 naval helicopter with around 700 sailors and marines. 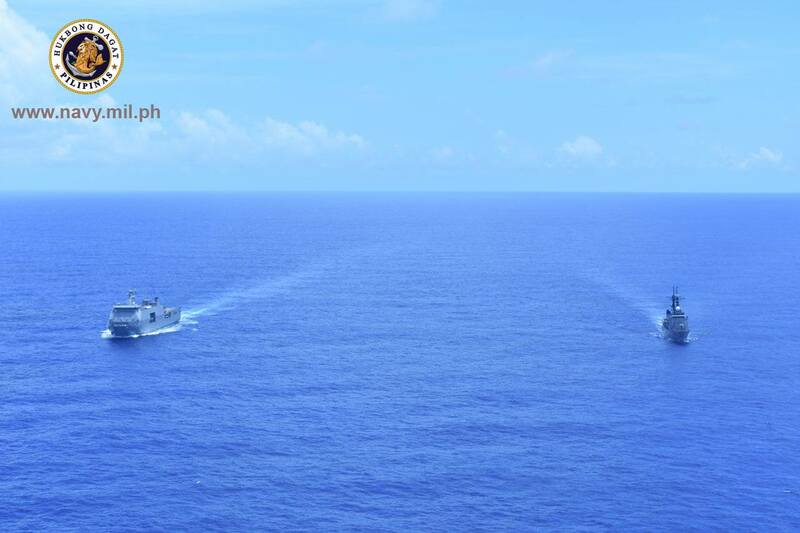 During the replishment-at-sea exercise, Zata said the BRP Andres Bonifacio was paired with the USNS Brashear (T-AKE-7) which suprised the Filipino ship and crew with the message, "We love Philippines, Good to See You Kababayan" which was attached to the American vessel's port side. Also, the captain of the USNS Brashear took time to greet the officers and crew of BRP Andres Bonifacio while the latter were conducting a maneuver. "Magandang hapon, Kapitan (Good afternoon, Captain) Jerry Garrido at mga (and to the) crew ng (of) BRP Andres Bonifacio," Zata quoted Garrido as saying. Also, the crew of the American ship took time to wave and greet their Filipino counterparts. RIMPAC is the world's largest joint and combined naval exercise and slated from June 27 to August 2. Peruvian Navy maritime patrol boat BAP Ferre (PM 211), front, and Philippine Navy frigate BRP Andres Bonifacio (FF 17) steam in formation during Rim of the Pacific (RIMPAC) exercise, July 27. Philippine Navy frigate BRP Andrés Bonifacio (FF 17) participates in a group sail during the Rim of the Pacific (RIMPAC) exercise off the coast of Hawaii, July 26.